How do you take an all American favorite treat and make it even better? My husband's two favorite treats are rice crispy treats and anything chocolate. So last year when my sister found this recipe for rice crispy treats stuffed with caramel, I had to take it up a level and add chocolate. They turned out pretty darn fantastic. You might think there's no way to mess up this classic treat. But lets be honest...we've all been at the family picnic or church party when we spot the rice crispy treats, our mouths start to water, only to take a bite and find they're as hard as a rock or dry as a bone. So what went wrong? 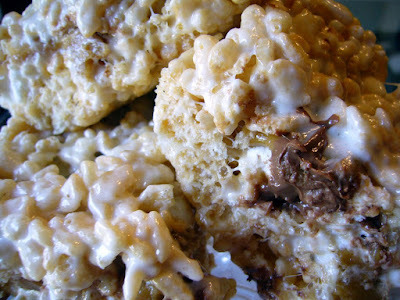 Here are some quick tips for making a gooey melt in your mouth rice crispy treat every time. 1. Be sure to use fresh marshmallows. I know this sounds silly but marshmallows that are old or have been partially melted in the car or a hot cupboard will make your treats hard as a rock. 2. When you are melting the marshmallows over the stove top, be sure not to over cook the marshmallows. They should just barley melt then add the rice cereal. Once again, if the marshmallows cook too long, your treats will be hard as a rock. 3. Be sure to use the right cereal to marshmallow ratio. Too little marshmallows will make for a dry rice crispy. 4. Be sure to use enough butter. This is not a treat that can be made low-fat. Sorry, if you're looking for a healthy treat, you are on the wrong track. Too little butter can make the treats dry and hard. 5. When spreading the treats into the pan, get your hands good and wet with cold water. This will allow you to spread the treats without sticking to your hands and fingers. 1. Generously spray a 9x13 pan with non-stick cooking spray. 2. Melt half the butter (1/4 C.) in heavy sauce pan over low heat. Add 4 C. marshmallows and turn up to medium heat to melt. When marshmallows are melted, add 5 C. rice crispy cereal. 4. Spread additional 2 C. marshmallows on top of first layer. 6. Drizzle chocolate over marshmallows. Be sure to evenly distribute chocolate. 7. Melt caramels in a glass bowl in the microwave. Heat in 30 sec. increments until caramel is smooth. 8. Drizzle caramel over chocolate. Be sure to evenly distribute caramel. 9. Melt remaining butter (1/4 C.).) in heavy sauce pan over low heat. Add 4 C. marshmallows and turn up to medium heat to melt. When marshmallows are melted, add 5 C. rice crispy cereal. 10. Spread over the top of all the other layers. *To more easily spread the marshmallow mix, be sure to wet your hands with cold water. This will allow you to mold the marshmallows with-out sticking to your hands. **Chocolate should melt with in 1 to 1 ½ minutes. Do not overheat the chocolate or it will harden and crumble. Yummy, that sounds so good. I want to make them right now! I love your pictures and recipes. I just finished a two day apple juice cleanse (suppose to be 3 but 2 was plenty) and my mouth is watering over these recipes. Thanks for posting them. We still need to get together. I'm going to attempt these!!! They looks so so delicious!!! I love your recipes Minidi. ooohh can't wait to try this! I have made these so often since you posted this. Recently I made them for pack mtg. and I used peanut butter chips instead of the caramel, just to experiment, and I'm inlove with anything chocolate and peanut butter. They tasted great and everyone loved them.